Behind the scenes are just like it sounds. I have always love to see pictures of others jobs site. This gives me a lot of insight to how others handle a build. Such as what problems they had or what went into the thought process. Looking at a pretty pictures never tell me any thing. Content is KEY! The more I can get - the more I pick up - only helps me to be better at my craft. I remember going to one of my first workshops hosted by Dan Snow with Andrew Pighills. I asked more questions at lunch break then they both bargained for. I'm not sure either had enough time to start there lunch. Ha ha true craftsmen helping a eager learner. Good thing I'm still at it. Other wise I might owe them both a lunch wagon. Thank you both for answering all my questions. 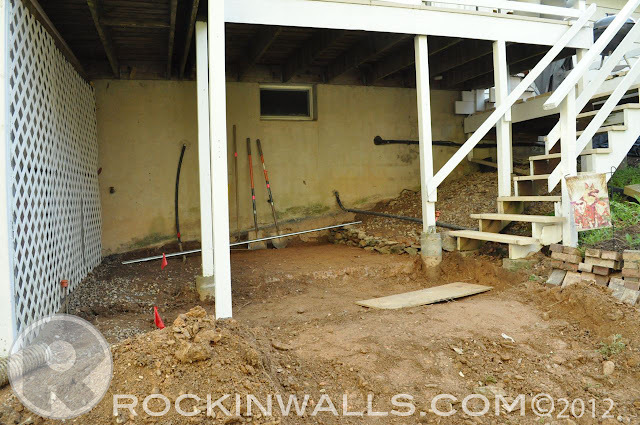 The Appaloosa Way Project had a great deal of issues I had to deal with on this build. I have listed a few of what I feel are some of the largest issues I had to work around and with..............Feel free to ask any questions on comments. 1) The walk was built to matching the porch both for being square and with the grade pitch way from the house. (porch is pitched away from house) Higher on the right, lower on the left. Allowing for water to flow away from the home. 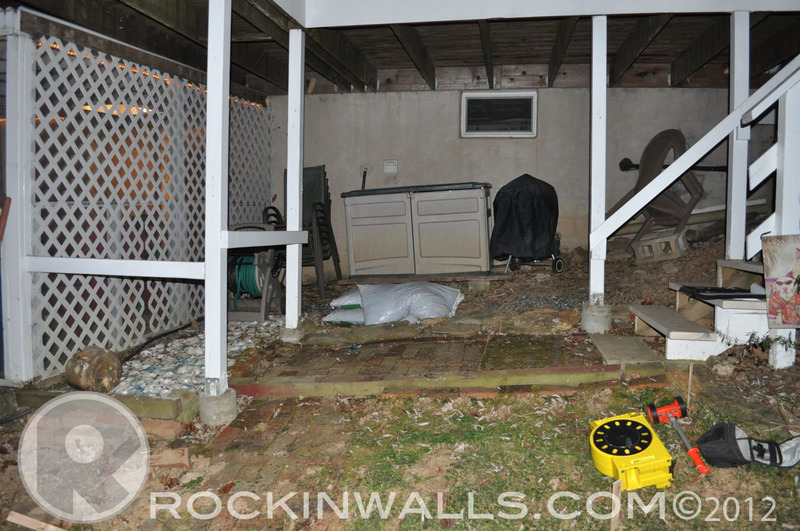 2) Porch cement posts. I decided to work my build off of both of these. Using them as my edge. At the time I was not sure how the granite edges would work out in the build. It was in my head as a plan. But I really didn't know how it would come out. I planned to have the cement columns dictate my edge of the brick walk. 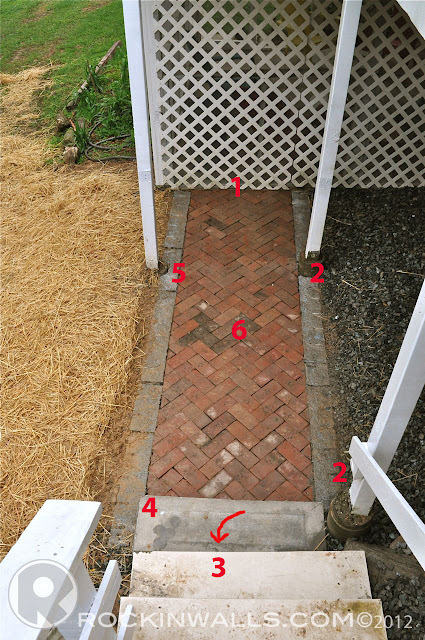 3) The porch step shows that the porch/wood step is off and not built square. I know at some point the steps and porch will be rebuilt. The walk will out last wood any day! Building it squared up with the porch also looks visually correct when you look down or view the direction in which you travel. Your eye doesn't go right to the step since its the smallest focal point. Unless I point it out. 4) Granite step needed to match the edge of the porch steps. But also site plus against #2 the column. 5) Granite edging was built on out side of granite step and to the end of the step. At the #5 I needed to work around my last cement post. I was lucky enough to have the height of the column be the same level of the granite edge - LUCK! 6) The brick herringbone bone pattern needed to match the steps being 3' ft wide. Including the granite edges on both sides gives an additional 1' ft. Making the total walk 4' ft wide. A comfortable walk. 7) Now the granite step needed to match the other steps and built #9 level to match. The walk is not built level in order for water run off away from the home. Now the normal step the rise or the space between each step #13 is 7" inches. I had to think about how to best deal with this matter. The choice I went with was to split the difference. #7 side of the granite step I built the walk to hit 6 1/2" inch mark at #8 the stone is 8" inches which is the height of the granite step. (recap granite step 3' long x 8" high x 12" wide) The granite step has a 12" tread - a little larger then the wood steps. This makes for a nice landing step. The stone is 3' ft long to match the walk #11. When I came to the site with this granite stone I knew the walk was going to be 3' wide. I also knew I needed a 7" height in the stone step. I didn't know how every thing else would work. 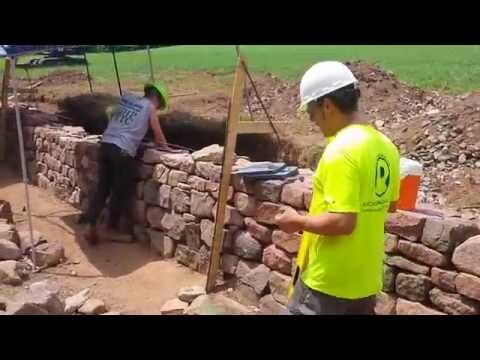 So I worked with the stone to help dictate more of my plan. The stone told me what to build. I find some times working with the materials they will help to guide you. As to what will work the best. If you try to tell stones what you want-you'll loose every time. A partnership is key to any relationship. 10) The granite step needed to match the wood steps on the outside edge. If it didn't it wouldn't look right. Just like a after thought. On such a small job like this one little thing can make every thing else look wrong. A harmony needs to be met with each and every part of the job. 11) You can really see how the walk pitches away from the house. I had several challenges to work with. Keeping the inside (left) higher (water flow away from home) but fitting the step in and working to have every thing flow down to the porch. When I built this I set my string lines up after the step was in place. The inside granite edges are where the strings were set. I worked to match the string lines by placing my granite edge to hit the line. See pic below. 12) The granite step needed to come to the edge of the cement pillar # 2 which was added later then the porch since the porch post was only sitting on soil. Yes can you say a home owner special. One to many home improvement shows. 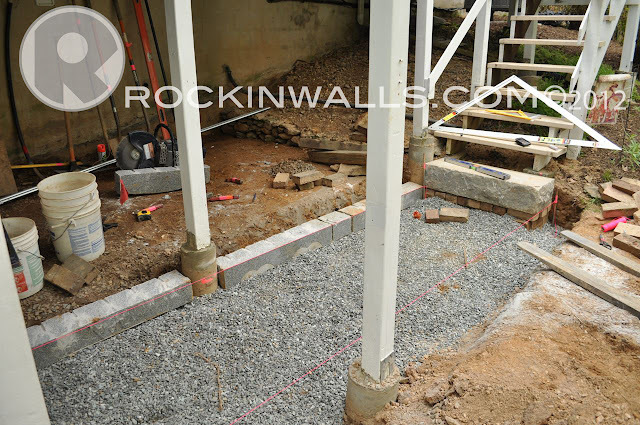 But the new home owners took the time to be sure to dig and put the cement pillars in. If you have ever done these yourself you know you can only wing getting them close. My point? My granite edge comes to the pillar and stops. The granite step had to be hand chiseled to knock of some of the high points in order to get a closer fit. 13) Shows the 7" step rise I needed to match to all the wood steps. Making a smooth transition from one step to the next. By splitting the walk to be #7 6 1/2" on left and 8" on right ends up making the middle 7". Once again making for a comfortable step up or down from the walk. String lines set to step. The step is key to the build. If you look at the original (picture below) pre project picture you can see degree of grade that the walk goes down hill. This walk is crying out for one more step. This photo above is not # but take a moment to notice the red flags! RED FLAGS! To left of white poles. Yes this is a power line right in the middle of my build. Just so happens the line was just low enough to be out of my way on setting my granite edges and bricks. Just one more obstacle to work around. Remember before you dig - Call Miss Utility 811 Its free and its the law! ### The last little detail on the job site was how far I had to walk or drive the skid loader to bring the material or tools to this project. 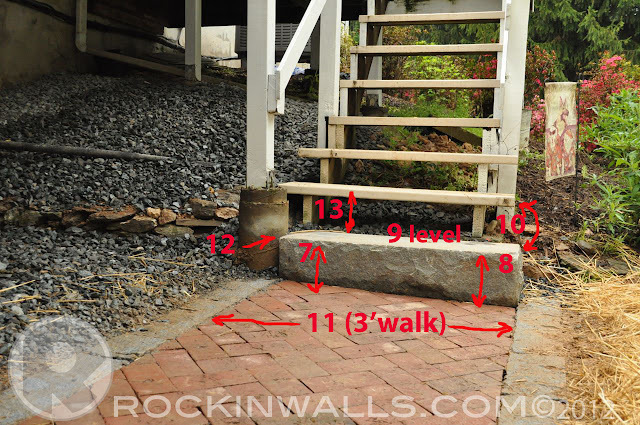 This sketch shows some of the basics specs on the walk and granite step. I'm sure some where in this mix I've missed some details. I feel these behind the scenes can help others when thinking throw projects. 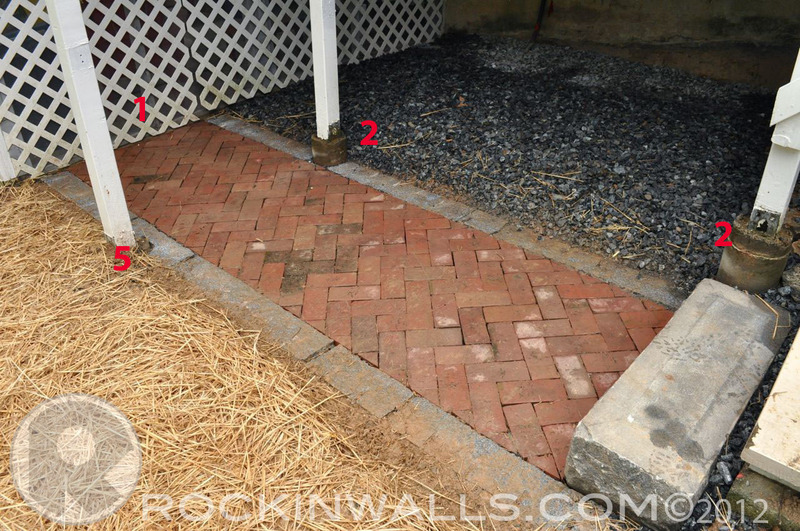 Or just allows someone to appreciate just how much goes into a small brick walkway like this project.